What customers use their local library for and what they think of the service provided. The most popular reason for visiting a library was to borrow books (64%), followed by borrowing DVDs (23%) and using a computer (20%). Respondents expressed a high level of satisfaction in relation to the service received and the help and support provided by library staff. Some comments were made in relation to opening hours and access to library buildings. We are considering how to improve access and toilets at Musselburgh Library and whether opening hours at Dunbar can be increased. We will continue to investigate e-book provision. We will conduct surveys regularly to seek the views of customers on service delivery. The results of the Customer Service can be viewed below (in either Word or PDF form). The Library Service is carrying out a consultation on what customers are using their local library for and what they think about the service provided. 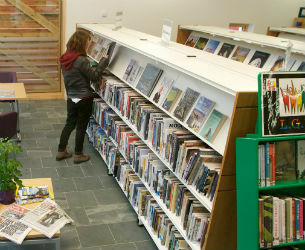 Customers visiting town libraries between the 6th May and the 25th May will be asked about their visit as they leave the library. Customer visiting village libraries during this period will be handed a survey to complete themselves. Carrying out this consultation will help us to plan for future developments and to improve the service we provide.